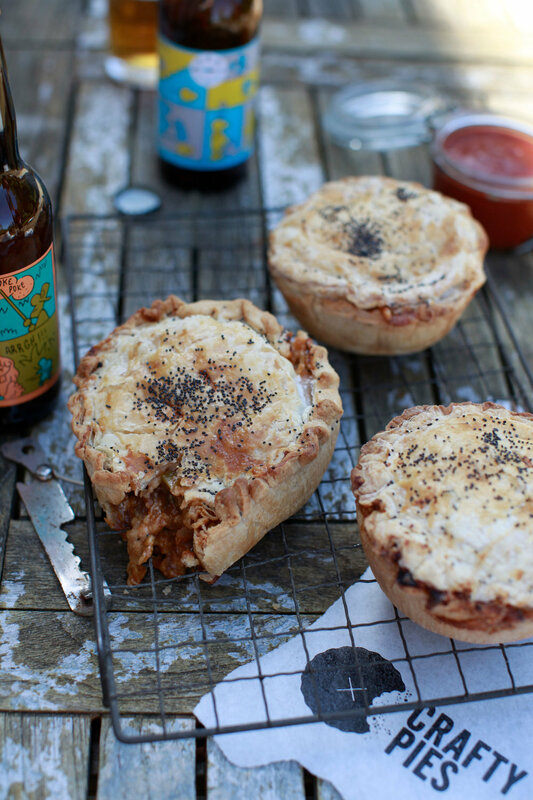 Crafty Pies is on a mission to get people excited about pies again. We challenge convention and break down the barriers of what people expect a pie to be by making bold and outlandish pies with attitude. We never compromise on flavour, quality or texture, whilst always bringing you something new and different. 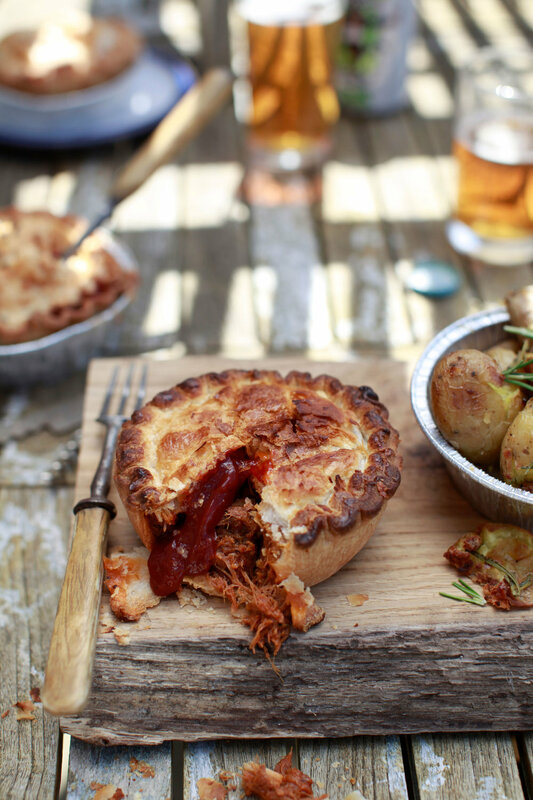 We want to take pies to a whole new level - creating a truly distinctive experience. So come and join us in our quest to move pies beyond the ordinary and say yes to Crafty Pies. We love partnering up with venues, taking over their kitchens, delivering a totally new experience to their customers. Come find us in and around London serving up our Crafty Pies - check our social media to see where we are next. Weddings, Birthday, Christenings - We've done them all so if you want Crafty Pies at your event then get in touch. Made with our unique pastry recipe we developed for two years - think of the love child of short crust pastry and pizza dough. Syrian spiced meat balls baked in a Aleppo chilli tomato sauce, lemon yogurt, turmeric cabbage, pomegranate mollasses and pickled herbs. 24-hour marinated chicken in our buffalo and blue cheese sauce. Slow roasted for 3 hours, pulled apart and topped with our onion chutney, avocado salsa and sour cream and pickled coriander. 24 hour marinated, slow cooked for 6 hours, pulled apart and smothered in our in-house Bourbon BBQ Sauce. Steak mince mixed in with our 4-hour braised steak in a spicy chilli pepper infused tomato sauce finished with a slice of American Cheese. Chipotle Baby-back Rib & Ham Hock. Our in-house Chipotle BBQ sauce smothered over Baby-back ribs overnight. Slow roasted for 8 hours, topped with a final coating for extra sticky ribs paired with a slow braised pulled apart ham hock mixed in our spicy chipotle sauce. Maple Glazed Lamb with Winter Berry. The perfect combination of sweet and sour. Slow roasted lamb coated in maple syrup topped with our wild blackberries. Hit with the sweet sticky maple then contrasted with the sharp tangy blackberry to balance perfectly. 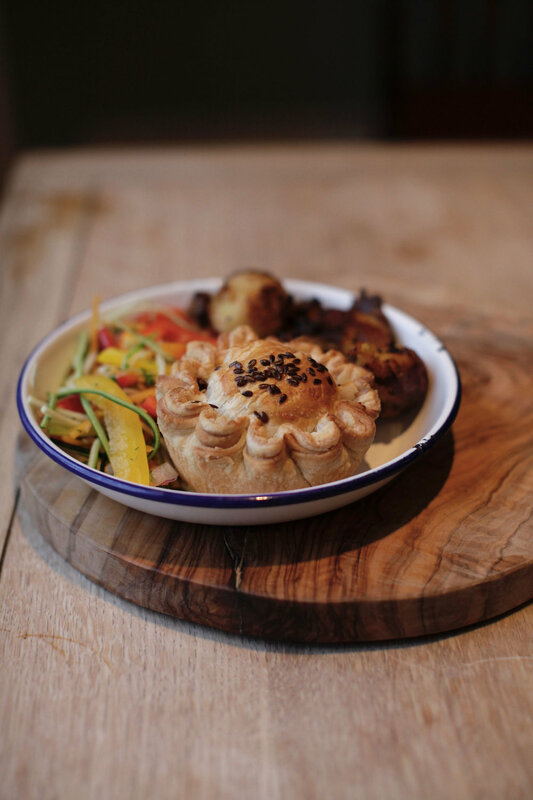 Our vegan pie – Sweet potato cooked in our in-house Jerk curry paste with black beans, roasted red peppers, topped with a bit of vegan cheese. Want to team up with us or fancy some pies for your private event? Please get in touch and fill out the form below. We’ll get back to you asap.